This exhibition is a presentation of pieces from the Heard Museum’s permanent holdings of Indigenous Alaskan and Canadian First Nations art. A Land North celebrates the complexities of these cultures and highlights the diverse representation of artworks in the Heard Collection. Featuring more than 100 years of objects, starting at 1900, the exhibition spotlights pieces in mediums including works on paper, textiles, basketry, scrimshaw engraving, jewelry, and sculpture. 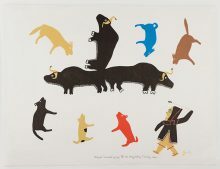 Many of the works, such as the ivory engravings created by Angokwazhuk (Happy Jack) and baleen basketry by Robert James and Carl Taalak, were produced specifically for tourist consumption, whereas the textiles of Victoria Mamnguqsualuk and the prints of Simon Tookoome were produced as narrative devices. Themes explored by the artists include notions of shamanism and the interconnectedness of the metaphysical and the land, illuminating transformation, and spiritual practices. Other works depict daily life and the flora and fauna of Alaska and Canada. Each of these works elucidates the cultural continuum of Indigenous peoples in these territories.